Nominated for 11 Oscars in 1999, Saving Private Ryan will go down as perhaps the best war movie ever made. It actually didn’t win Best Picture, having the bad luck to go up against a tough quartet: Shakespeare in Love, Elizabeth, Life Is Beautiful, The Thin Red Line. For me, it would be hard to choose between Roberto Benigni’s masterpiece and Steven Spielberg’s, but there is no arguing that Saving Private Ryan is as near to perfection as you can come in its genre, a military film that is also breathtakingly beautiful and overflowing with honest emotion. Perhaps Braveheart could contend for the top prize, although I understand that I love that movie in a way not all critics do, and that it’s more of a soundtrack-driven epic than a military drama. 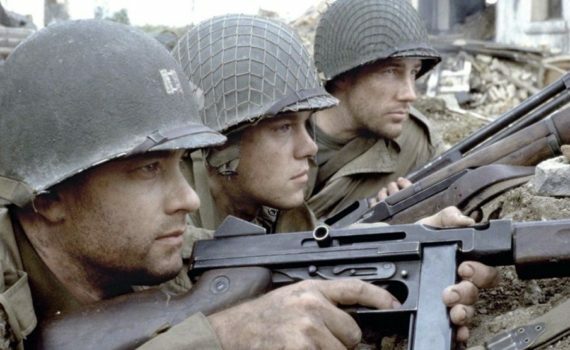 But as far as modern war films go, nothing compares with Saving Private Ryan; an instant American classic, history come to life, and something we can all benefit from watching. D-Day, 1944. Allied troops come aground at Normandy in an attempt to deliver France from German control, ultimately turning the tide of the war against the Nazis and the Axis powers. During this battle, and elsewhere in another WWII campaign, three brothers are killed, the Ryans, leaving the fourth, last, & youngest somewhere deep in enemy territory. Alerted to this situation, American command determines that James Ryan must be returned home from the front, although his exact whereabouts aren’t known. Captain Miller of the 2nd Rangers is given the task of assembling an eight-man team and rescuing Ryan at whatever cost, a mission for one man that puts the lives of many others at risk. As the unique company struggles with accepting their objective, the war continues around them, putting the company in danger time & time again, as they embark upon their seemingly impossible task, saving Private Ryan. Do I even need to really critique this film? Aren’t we all in agreement that it’s amazing? Never has war been shown this starkly, this graphically, but at the same time this human. The D-Day scene is legendary, putting you inside the battle in a nightmarish way you’ll never forget. Spielberg directs a near-perfect film, with scene after incredible scene of violence & heart, mixing together to blow us away. Hanks as the lead, Davies as the eyes of the audience, Damon as the young patriot; a stellar trio to assume this burden. Then there’s the rest of the crew, a stellar group: Tom Sizemore, Edward Burns, Barry Pepper, Adam Goldberg, Giovanni Ribisi, and even Vin Diesel in his best role. Don’t forget the solid cameos as well: Bryan Cranston, Dennis Farina, Paul Giamatti, Ted Danson, and Nathan Fillion. Add it all up and you’ve got something more than a must-see film; a must-own film, a must-share film, a must-show-your-kids-when-they-are-ready film, something that’s both impeccably-made & important, a film for the ages.